Starting of with the title chorus, and featuring one last (for awhile anyways) Robert Pollard / Tobin Sprout harmony line, “Jane of The Waking Universe” would have fit on any of their previous albums, right down to the melody-line aping wah-wah solo which wriggles in halfway through. 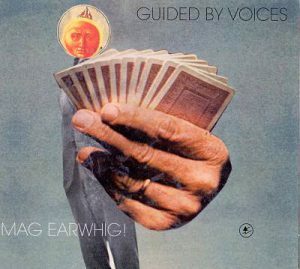 But even with the guitars melded together into a distorted roar that had to completely stop just so the bass go squeeze in a hook, “Jane of The Waking Universe” fit in way more with Mag Earwhig! than Bee Thousand. In a weird way, “Jane of The Waking Universe” had its foot in both doors: it was rough, unpolished, but still completely huge-sounding. And, naturally, sported the most memorable melody line on the entire album.